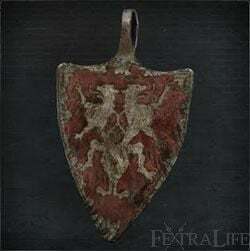 Badge of the royal guards of Cainhurst, loyal guardians of the Vileblood Queen Annalise. The Vilebloods are hunters of blood, and hunt prey as they search for blood dregs. The hunter who joins them is faced with a decision: to merely borrow their strength, or to become one of them, heart and soul." Cainhurst Badge is a Key Item in Bloodborne. Used to be able to purchase the Chikage, the Evelyn, Numbing Mist, and the Cainhurst Set from the Messengers. The badge resembles the coat of arms of Richard Lionheart. My first visit with the Lady of the Covenant i declined the offer and now she dont let me join the covenant ... any options for me now? or do i have to play again the whole game Oo.